I’m sitting at the kitchen counter, roasting some Sulawesi Toraja AA, thinking it’s a really good time to introduce version 2.1. Yes – you heard correctly – finally! I’ve been in contact with many of you about things you’d like to see, many of you have been very, very patiently waiting. Thank you for your patience – I believe you will be vary happy with this update. I’ve uploaded it to iTunes – hopefully will be less than a week for the approval process. So what’s new? Well, most probably most importantly is an official “Reading” mode for curves. Each curve can now be set to function as a “Control” or “Reading” curve. If in reading mode, you can choose between Celsius or Fahrenheit systems. 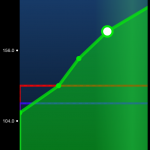 Reading curves graph as traditional point-to-point graphs (diagonal lines, connect-the-dot style). They are also excluded from past roast matching. The second most requested feature is a larger graph. Well, hold onto your britches – this update has a full-screen graph. It responds to device orientation, displaying either landscape or portrait, and can be pinch-zoomed, scrolled, panned, etc. 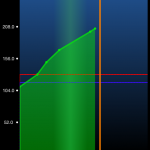 You can even increase or decrease the resolution of the x-axis to show more detail. It is interactive – you can tap individual nodes to select them and change their value (assuming they do not belong to a past roast, or master profile or program), or enter a new value with a curve selected to record a new time-stamped node. 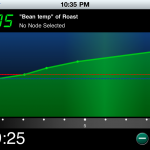 At the moment there are no roasting controls in the full screen graph window. I will be adding those, but for now this is a great start. Any type of control I add will be in the form of a pop-up console. I don’t want to devote any screen real estate to extraneous buttons. I want to keep it all for the graph. I fixed a few bugs with data entry that cropped up in iOS 4.x, after Apple changed some things internally related to the slot-machine style picker views, and added support for larger inventory amounts in the database. Oh yes, this one’s fairly cool… You can now publish a roast to your Facebook wall. That’s one of those things I’ve been wanting to get done for a while now. I you like this, please let me know and I’ll extend it to Blends and Cuppings as well. I’ve done a little behind-the-scenes work to prepare for a port to iPad. As I’ve told some of you, I really doubt that it will be possible to create a universal app (1 app for both iPad and iPhone/iPod). Roastmaster is a very complex app, and having only one codebase that conditionally perform and allows different functions, controls and layouts for each view, would be horrendous and error-prone. I’ll have to decide once I get started, which will be the easiest path. I’ll keep you updated on the progress, and be in touch with those of you that have said you’d like to beta-test. Well, that’s it for now. Be on the lookout for the update. Wow, that was a nice update. It’s nearly addressed everything for me. As for feedback on an iPad variant. Even what you’ve done so far makes it pretty usable on an iPad. The Graph was really the only place I felt the need for more real-estate. From my perspective, if you were able to take the app as is and put in higher res fonts and bitmaps but leave the placement as is, and alleviate the 2x scaling artifacts, I’d say you could call it done. It does puzzle me that the 2x mode on an iPad shows as many artifacts as it does. Back in the day, I was a beta tester for HandEra (PalmOS). They helped bring the first “hi-res” apps to the Palm platform. Palm devices later had an easier job being able to straight pixel double from 160×160 to 320×320. The HandEra 330 devices had a 240×240 display area with virtual graffity area that could shrink and give a 240×320 display area. The OS did a fantastic job of on the fly substituting high-res fonts (rather than scaling them), and other UI items. The only thing that had to be scaled (if the app didn’t have a native high-res set included) were the bitmaps (tricky because it was a 1.5x scaling). And yet we seemed to pull that off years ago better than Apple’s ipad 2x mode. As for Roastmaster, I’d say you’re essentially functionally perfect now with 2.1. If it just scaled in resolution to maintain the crisp iPhone appearance, you’d be done without having to fit more content onscreen. I can live with 90% of everything in portrait. Glad you like it! HandEra beta tester, huh? How cool! Agreed, the iPad’s emulation scaling is dismal. All of Roastmaster’s art files have 2 copies – 1x and 2x. I really wish it would at least swap out the hi-res art like the app kit does on iPhone retina displays when iPad scales. Apparently the emulator doesn’t go that deep. The landscape code should be minimal – I did some tests when coding v2.1. I plan on devoting the extra horizontal space in the header of details views to a summation of notes. That kind of thing really needs more importance than it has now. If that works out space-wise, browsing in landscape would enable you to read notes without swiping down to the bottom of every record. I think that would be a timesaver. Great feedback – I love having input – it keeps me from venturing into directions people aren’t really interested in.